Lake Martin Residence - Tan Color - Supporting Infinity Edge Pool and patio. Autumn Blend color - Aluminum Fence (top) attached to cap. Various circle and radius detail. Various design examples (engineered fill / 1 ft drain zone). 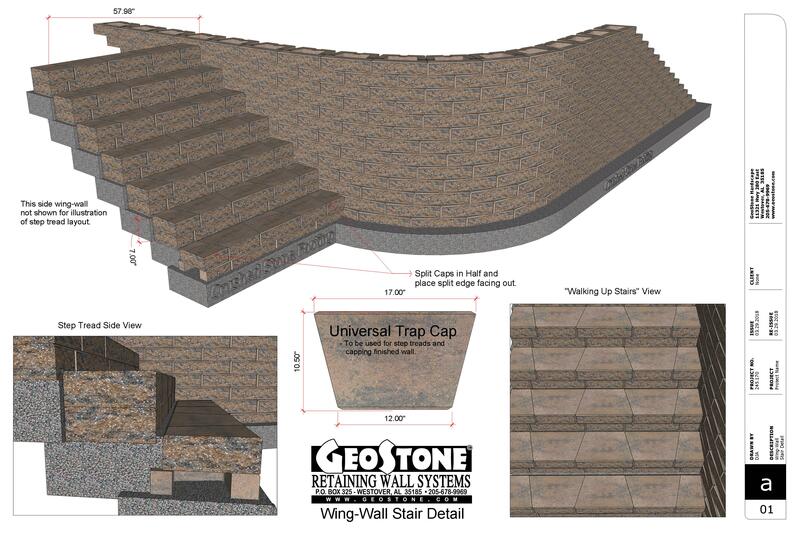 GeoStone Ashlar Wall spec sheet. Tiered Wall Application - Top wall always creates surcharge on bottom wall unless distance between the two walls is over double the height of the bottom wall (2:1 rule). Also referred to as the GeoStone Landscape Block or the Residential Unit, this block is perfect for everyone from the professional landscaper to the weekend wall builder. It weighs in at only 36 lbs but don't let its size fool you. This block has been used to build walls as tall as 23 feet that are holding up commercial driveways, buildings, and parking lots. 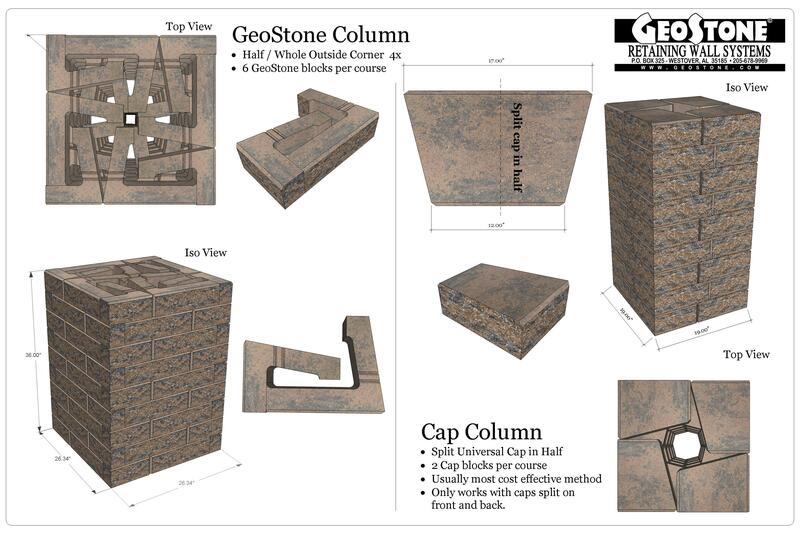 The GeoStone 4" block was created with the upscale landscape market in mind. The look of the big commercial units was unappealing to most. Stacked stone was the only alternative at the time and a costly one at that. GeoStone's 4" Landscape block filled the gap perfectly. Landscapers love it for its speed in installation as well as its "softer" appearence and DIY's love its look as well as its ease of installation. 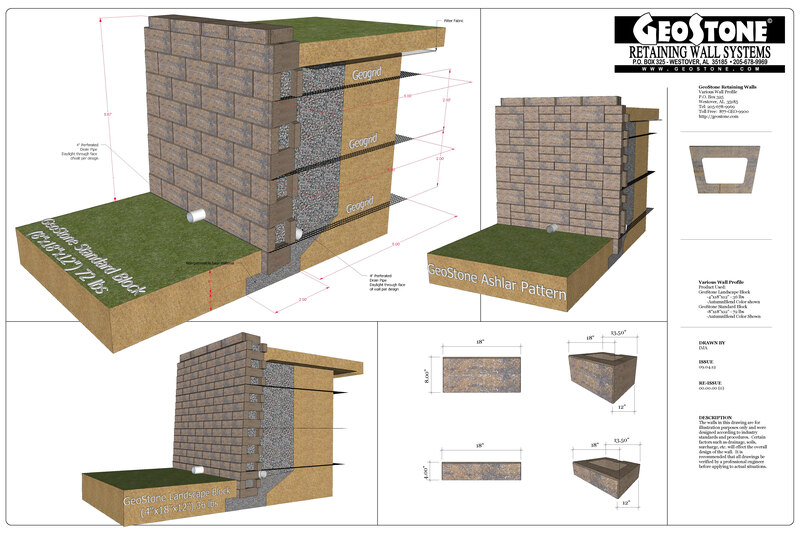 Today, over 75 percent of all GeoStone walls are built using the GeoStone 4" block. Hands down, this is the best block on the market. 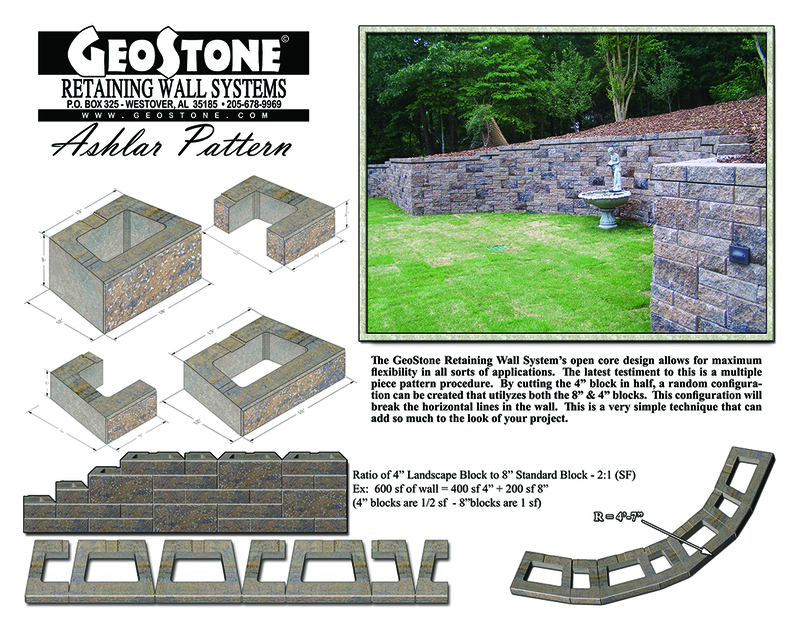 More about GeoStone Rock Interlock Connection. 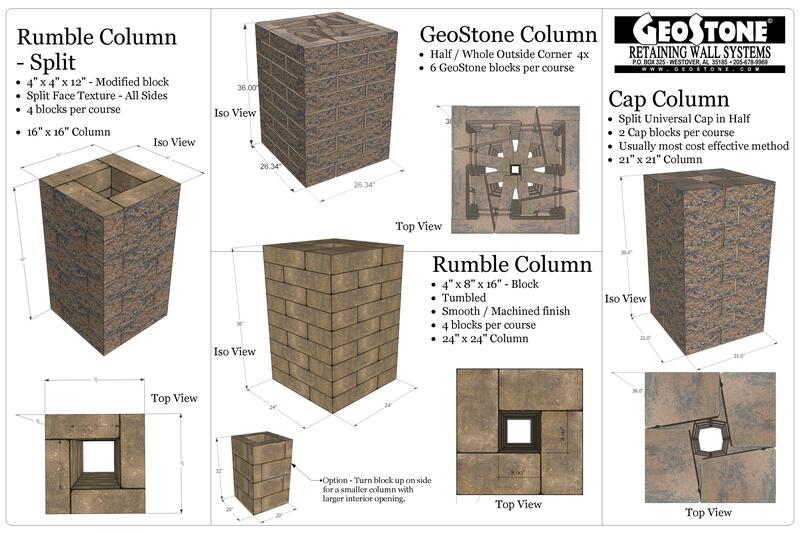 Often referred to as the "GeoStone Standard" block or commercial unit. 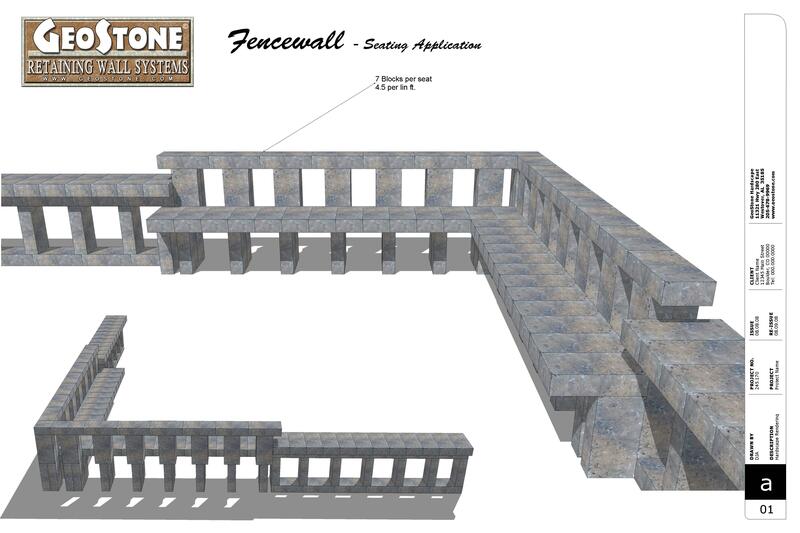 This product's primary use is in large commercial wall construction. Its size and weight tend to deter the weekend wall builders. Some of the pictures shown to the left show walls as tall as 47 feet. The GeoStone 8" can be used on its on or in combination with the GeoStone 4" block in either banding, patterns, or Ashlar. 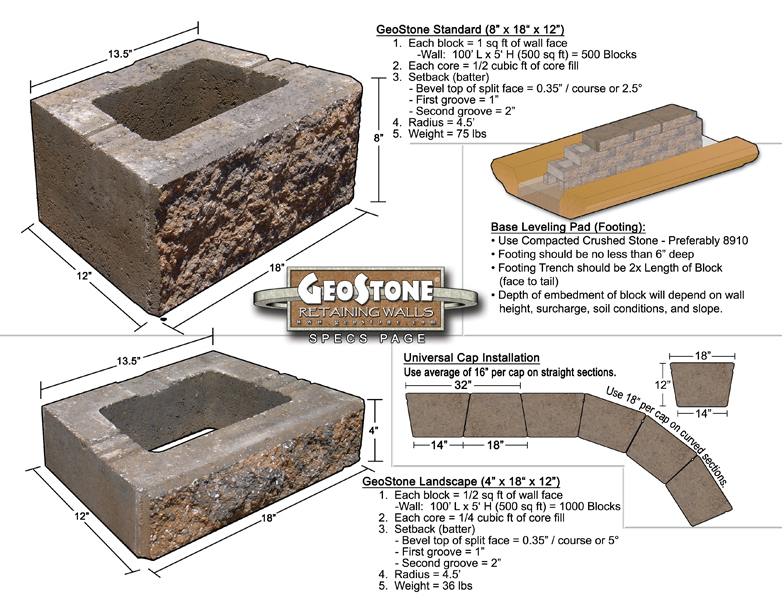 The GeoStone 8" block weighs in at approximately 72 lbs. This remains the lightest of the "full-size" commercial units. Lighter weight in the world of concrete products typically equates to lesser cost in both actual materials and logistics. In the commercial world every penny counts and this block is meant to save as many pennies as possible. Click on the link below to read more about why this is the most cost effective block on the market! 47 ft tall wall in Rock Quarry. Indention in top middle for slab to support 200 ton Yute dump trucks. Wall built vertical to allow Yutes to dump rock into crusher below. 47 ft tall wall in Rock Quarry. Indention in top middle for slab to support 200 ton mining trucks. Wall built vertical to allow mining trucks to dump rock into crusher below. Rock quarry wall. Machines shown behind wall could not get out until finished elevation at roadway was achieved. Rock quarry wall. Machines shown could not get out until finished elevation at roadway was achieved. Rock quarry wall. Machines previously shown could not get out until finished elevation at roadway was achieved. 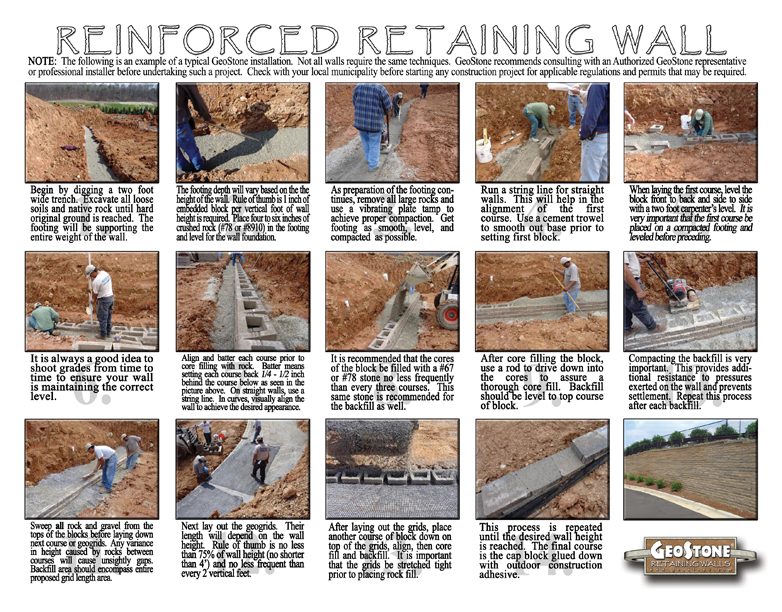 Reinforced Modular Retaining Wall Basic Installation Procedures. 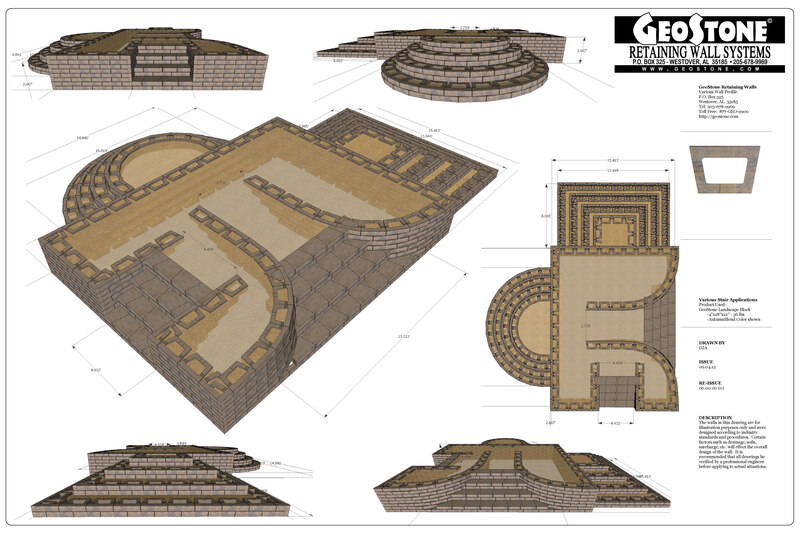 Ashlar Wall Pattern spec sheet. Due to Universal Cap's Shape, both radii and straight sections can be easily achieved. The perfect cap for just about any situation. This cap is able to go straight as well as turn without making cuts. Capable of turning a radius as tight as 4.3325" (depending on region) the universal cap is one of the most versatile on the market. A split face on both the front and the back along with a symmetrical design allows for flipping and turning. Notches on the side make it easy to handle. Typically comes 56 to a pallet. Due to Block's Shape, both radii and straight sections can be easily achieved. The perfect cap for just about any situation. This cap is able to go straight as well as turn without making cuts. Capable of turning a radius as tight as 2.89 ft., the universal cap is one of the most versatile on the market. A split face on both the front and the back along with a symmetrical design allows for flipping and turning. Typically comes 63 to a pallet. One of the most versatile products in our arsenal, the Rumbled™ Wall (formerly known as "Plantation Stone" in the Alabama market) can build just about anything your imagination can devise (not to be used as a structural retaining wall). Its size allows it to turn and flip to make different configurations or patterns in a structure. Standing up, laying down, or up on its side, the Rumbled™ Wall fits together like a puzzle to make such outdoor structures as fireplaces, bars, kitchen areas, seating, fence walls, small retaining walls, free standing walls,and so on. It's tumbled look gives it that old world appeal while its machine made size makes it easy to build with. 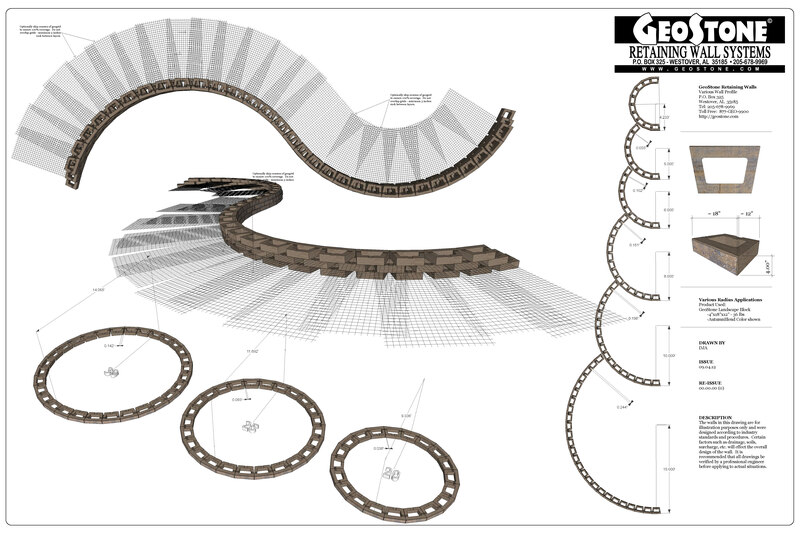 Ask about our 3D design services with this and our many other products. 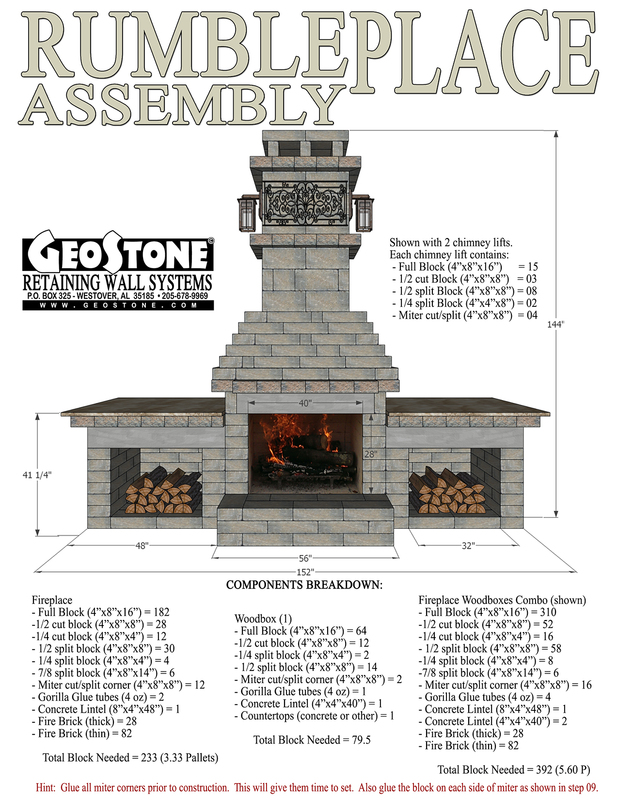 The Rumbleplace Mini has become our best selling outdoor fireplace. A smaller, refined version of the larger original Rumbleplace shown here, the Mini proves to be the perfect fit for the back patio or by the swimming pool. 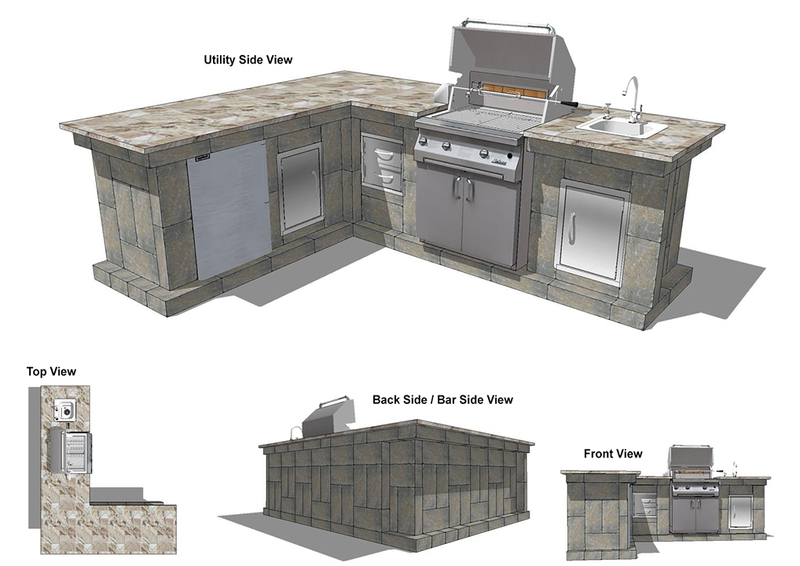 This is something that can be put together over the weekend by two people or have installed by a pro and ready to use that evening. The price point is the most attractive feature of this outdoor fireplace. Kits are pre-cut and numbered (shown below) and simple step-by-step instructions are provided upon purchase. Add travertine or marble tops along with decorative iron for accents to complete and customize your creation. This is truly the most economical fireplace on the market. For pricing call right now! Maybe you have more retaining wall questions. That's understandable. Here are some of the more frequent questions I get from emails. If there is something not covered here, shoot us an email. We actually read and them and respond. I know, crazy, right? There's no pins or lips, so how does it connect? Through the most powerful form of connection which is Rock Interlock. 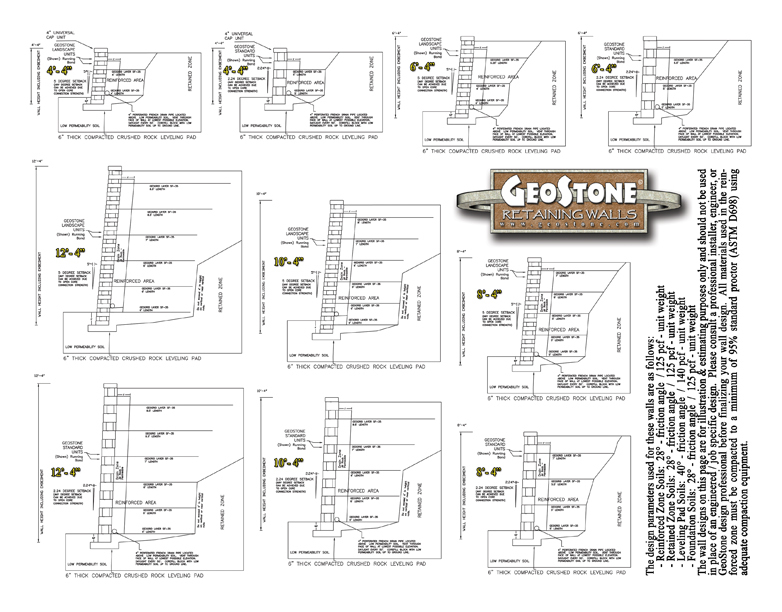 By filling the cores with crushed limestone (#57 or #67) GeoStone utilizes friction to lock the units together. Much like Velcro (on a much larger scale of course) the connection is based on direction of applied strength. Pulling two strips of Velcro apart, up / down, is not very difficult. Pulling them apart, side to side, or horizontally is near impossible. That is because there is literally thousands of connection points. This is very similar in concept to GeoStone and Rock Interlock. The gravel has thousands of connection points in each core of each block. If one or many of those points shift, they reform connection with the many other points within the cell. A wall's connection is meant to resist horizontal or lateral pressures exerted from behind. Do I have to use GeoGrid? The answer to that would largely depend on the situation. The industry standard (rule for all SRW's) is that you should put grids no less frequent than every two feet in height. Factors like slope, soil conditions, backfill material, and surcharge (loading) can have an effect on frequency of grid placement and the length / strength of the grids. Remember, adding a layer or two of grid is cheaper and easier than rebuilding a wall. Should I use the 4" or the 8" block? First off, both are equal in strength due the same footprint and connection properties. Large commercial or anything over 16 ft tall - definitely the 8" block. This is due to extreme pressures that may require more compression resistance that are typically not present in most residential applications. Anything else, I would use the 4" block. The 4" builds faster, looks better, and is so much easier to work with. It is easier to maneuver, to carry, and its flexibility is unmatched. Not to mention, its overall look is unique and there is nothing else out there like it. You can also combine the two to create banding or Ashlar.